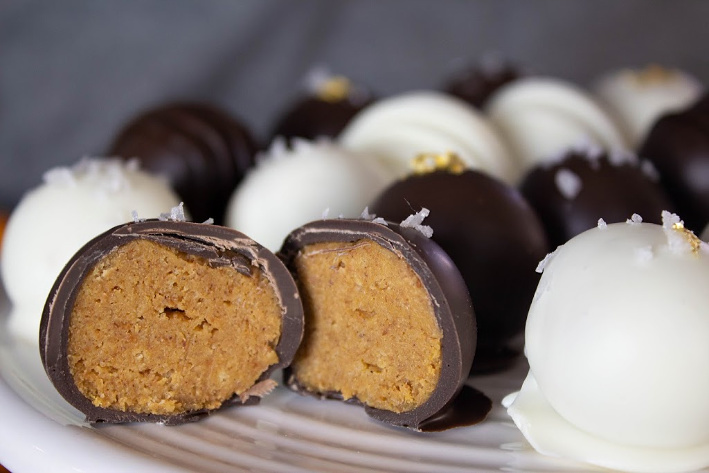 Pumpkin Truffles are a nice creamy bite of pumpkin pie flavor covered in rich dark or white chocolate. Perfect for a hostess or neighbor gift or even just a sweet lunch snack. I’m a little late to the Pumpkin Party but I’ve been searching (and testing) different pumpkin recipes that I hoped would be a little different than the norm that’s flooding your emails or Instagram right now. I think I’ve finally had success! Pumpkin Truffles or Grateful Truffles as a friend named them, these sweet little bites of pumpkin goodness satisfy any festive craving. They appear to be fancy but their method is anything but so (yay! )- Creamy pumpkin pie-flavored centers with delicious (good quality) dark or white chocolate make them perfect for sharing as holiday food gifts or displaying at the table to be devoured openly. 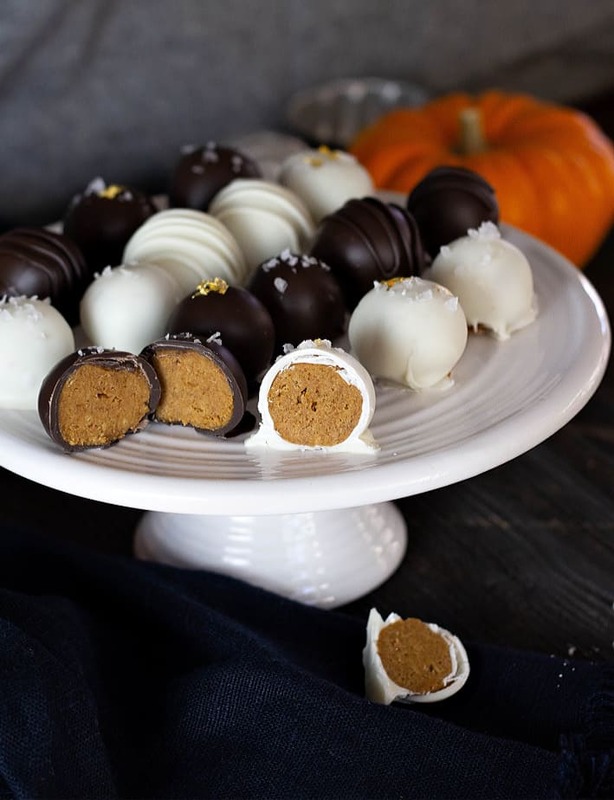 The truffle centers are a perfect combination of pumpkin puree, cream cheese, confectioners’ sugar, crushed graham crackers and pumpkin pie spice. The chocolate outer layer is nothing more than good-quality melting chocolate (easily found at local craft or specialty food stores, or online. Not pricey!). They’re beyond easy to make but require a little pre-planning because the truffles taste even better after a night in the refrigerator. A holiday treat easily made with the help of kids or as an activity for a group, or just when you want some quiet time alone. After the ingredients for the truffle centers are mixed in a stand mixer, the dough is chilled for a couple of hours, or overnight before being rolled into bite-sized rounds, usually about 1″ in size. Melt the chocolate in the microwave and then, using a fork so that excess can run back into the bowl, dip the truffles and place onto parchment paper to harden. For decorating, you may sprinkle a number of confections to make the Pumpkin Truffles pretty or leave them plain. I’ve added some flakes of Malden salt to mine but any coarse salt adds a nice sweet and salty contrast. Use a little edible gold leaf for extra fancy bites or add more of the melted chocolate into a sandwich bag with the corner cut, drizzling the chocolate over the truffle as desired. 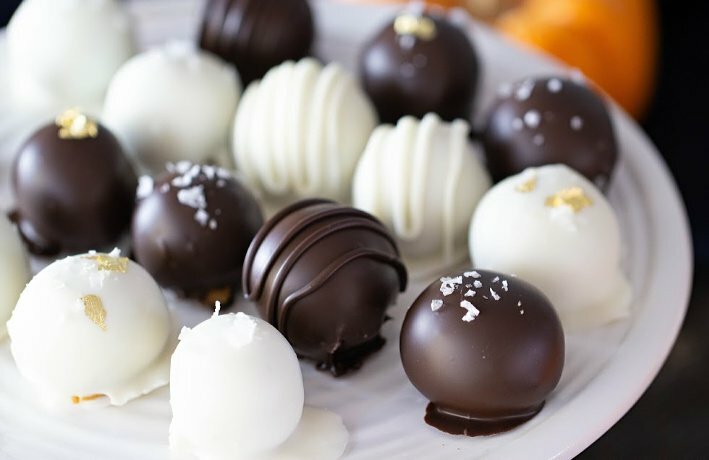 The finished truffles will harden quickly- if adding sprinkles, or salt to the tops, you should do so before the shine disappears to ensure the topping adheres well. After all the truffles are dipped and decorated, they’re best chilled overnight before serving or gift giving. This extra time in the refrigerator allows the flavors to really come out. I’ve made these truffles many times over now to get the flavors and textures just right (I have a very critical tasting crew). The center is creamy enough with a sturdy texture thanks to the graham crackers. They’re just sweet enough without being too much so- I kept reducing the amount of sugar until I was told they weren’t sweet enough and then added back in just a touch so the pumpkin flavor and spices could really shine. A chocolate truffle is traditionally made with a creamy center, often a chocolate ganache, coated in chocolate, cocoa powder or chopped toasted nuts. Truffles are often a spherical shape. The name chocolate truffle derives from their resemblance to truffles, edible fungi related to mushrooms. Do not skip the step where you chill the truffle filling for at least an hour before rolling into the truffle balls. This time in the fridge (even just for an hour) allows the ingredients to become just smooth and dense enough for successful balls. White chocolate is a little more temperamental than dark or milk chocolate wafers when melting, so here are a couple tips for you. I recommend melting white chocolate at no more than 50% power in the microwave. Test and stir the chocolate every 30 seconds. If the chocolate becomes brittle, you’ve heated it too much. Allow to cool a little and stir vigorously till smooth. Or melt the white chocolate slowly in a double boiler with a heat-proof bowl over a pot of softly boiling water, ensuring that the bowl doesn’t touch the water. If, when you dip your truffles in the white chocolate the chocolate isn’t nice and smooth upon lifting out of the chocolate, like if it kind of wrinkles across the truffle and seems thin, then it’s also too hot. Allow a minute or two for the white chocolate to cool and then dip again and it should work well. These sweet little bite-sized pumpkin treats can be fancy or plain. Great to make with kids. Plan ahead because they're better eaten the day after their made to allow all the flavors to continue to develop together. 1 Tbsp shortening, optional. See instructions. In a large bowl or in bowl of stand mixer, beat softened cream cheese and powdered sugar on medium speed until smooth and creamy. Add pumpkin; beat until combined. Add graham cracker crumbs and pumpkin pie spice; beat on medium speed for 2 minutes or until thick and smooth. Cover and refrigerate at least 1 hour or up to 24 hours. Line a large baking sheet with parchment paper. Scoop rounded teaspoons or cookie scoops of the chilled pumpkin mixture and roll into 1-inch balls or whatever size you like. Place pumpkin balls on the prepared baking sheet and chill 30 minutes. Remove pumpkin balls from the refrigerator. Using a fork, dip balls into the chocolate mixture, allowing excess chocolate to drip back into bowl. Place the dipped balls back onto the prepared baking sheet. Immediately sprinkle with salt or sugar; whatever decoration you're adding, if any. 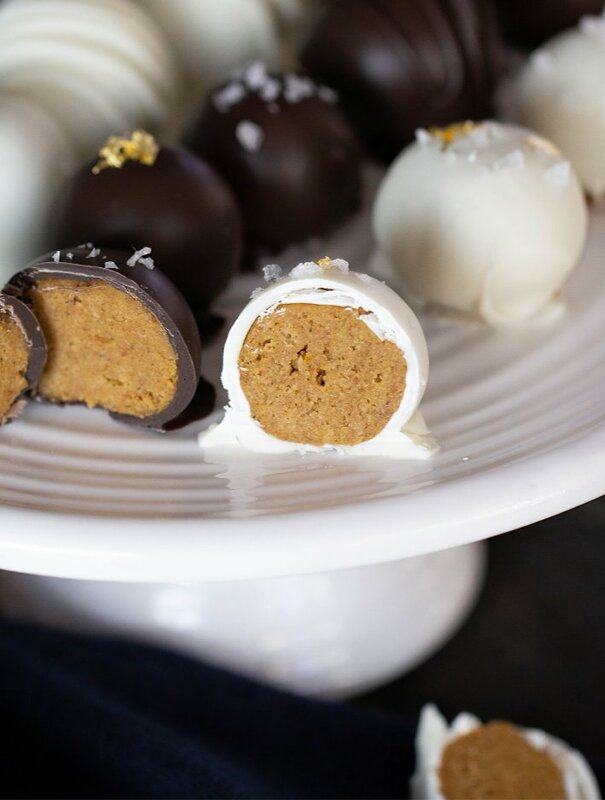 Continue with all the pumpkin balls, then return completed truffles to refrigerator to chill overnight before serving. 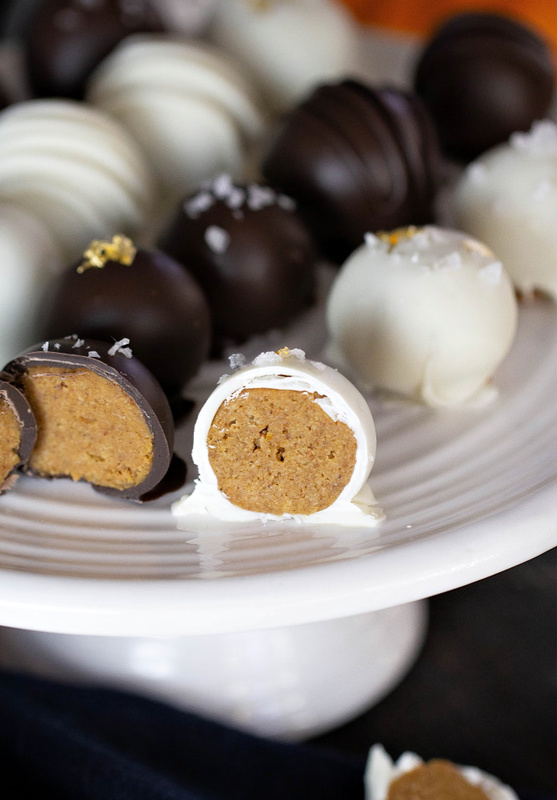 Pumpkin truffles can be placed in cellophane bags, little candy boxes or small paper or foil candy cups. Truffles keep in the refrigerator for at least a week or may be frozen for 2 months. Caution; frozen dark chocolate truffles may develop a white film that may not come off after returning to refrigerator. Truffles are excellent when served chilled. I highly recommend using chocolate especially made for melting. The highest quality melting chocolates are usually sold online or at local gourmet food stores. Melting chocolate is usually packaged as the chocolate discs, also called apeels. Good quality can be found at many craft stores. I used ChocoMaker Naturals (containing no hydrogenated oils, etc). I found them at JoAnn's. If you use regular chocolate chips etc., they may not melt very well and not harden to the desired level after cooling. White chocolate is temperamental when melting, so here are a couple tips for you. I recommend melting white chocolate at no more than 50% power in the microwave. Test and stir the chocolate every 30 seconds. If the chocolate becomes brittle, you've heated it too much. Allow to cool a little and stir vigorously till smooth. If when you dip your truffles in the white chocolate the chocolate isn't nice and smooth upon lifting out of the chocolate, like if it kind of wrinkles across the truffle and seems thin, then it's also too hot. Allow a minute or two for the white chocolate to cool and then dip again and it should work well. As I mentioned, the truffles can be rolled into balls whatever size you like, but the truffles shown in my pictures were 1" in size before dipping. I highly recommend letting the truffles sit overnight in the refrigerator before serving as the flavors of the filling and the coating seems to bloom overnight and compliment each other perfectly. Simply decadent! The presentation alone looks like they were made in a gourmet bakery. The taste brings together the perfect balance of pumpkin pie and chocolate flavors, with a deliciously moist and dense cake texture. My daughter loved these so much, that she is planning to make them for gift giving this holiday season. Best fall treat I’ve had all year! These are amazing!! These are such a great sweet treat! Perfect for taking to a holiday dinner party, neighbor gifts of thanks, teachers, or for binge watching Christmas movies! I love both the white chocolate a dark chocolate, but my favorite is the white.